Since the Middle East is home to some of the world's earliest civilizations, it is difficult to choose a starting point for examining its political history, for no matter how far back the investigator searches, there still seem to be deeper layers of historical and political developments that influenced the course of later events. For convenience, and admittedly somewhat arbitrarily, I have chosen the dawn of Islam as the starting point of this book. This has some justification: Islam as both a system of beliefs and a historical-political phenomenon has distinctively marked the Middle East, and its rise and evolution created dynamics that continue to shape the destiny of nations today. 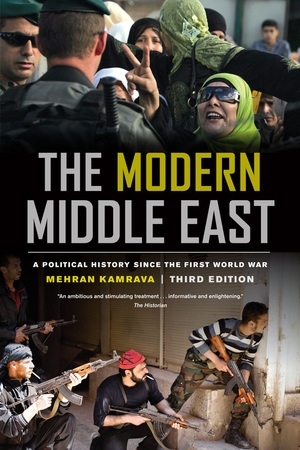 From the fall of the Ottoman Empire through the Arab Spring, this completely revised and updated edition of Mehran Kamrava’s classic treatise on the making of the contemporary Middle East remains essential reading for students and general readers who want to gain a better understanding of this diverse region. Mehran Kamrava is Professor and Director of the Center for International and Regional Studies at Georgetown University’s School of Foreign Service in Qatar. He is the author of a number of books, including, most recently, Iran’s Intellectual Revolution and Qatar: Small State, Big Politics. His edited books include The International Politics of the Persian Gulf, Innovation in Islam: Traditions and Contributions, The Political Economy of the Persian Gulf and The Nuclear Question in the Middle East.